My Mac Pro has just had it's first birthday and it was time to buy it a present - some new memory. The Mac Pro (Early 2008) comes with a minimum of 2GB but has a maximum capacity of 32GB. Although a have been trundling along with 2GB for the past year I am aware a memory boost would improve my machines performance with Photoshop, Aperture, Illustrator and in general. I decided another 8GB was what I needed and purchased a matched pair of 4GB DIMMs, I could have brought more 1GB DIMMs that has the advantage of filling all the slots and making best use of the memory buses, but decided the larger DIMMs would allow me to install the maximum 32GB at a later date. The Mac Pro (Early 2008) computer has tow memory riser cards with a total of 8 memory slots. On each card, the slots are arranged in banks of two. The computer comes with a minimum of 2GB of memory, installed as a pair of 1GB fully buffered, duel inline memory modules (FB-DIMMs) in two of the DIMM slots. Additional pairs of 1GB, 2GB or 4GB FB-DIMMs can be installed in the available DIMM slots, for a maximum of 32GB of memory. 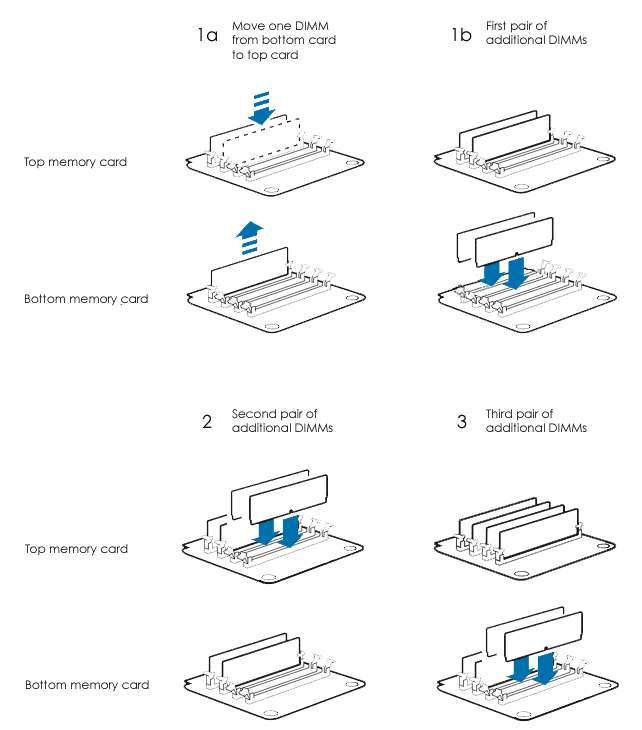 The above diagram shows the order additional DIMM modules should be installed in a Mac Pro. It’s important to install FB-DIMMs in matched pairs of equal size and specification. Larger capacity DIMMs should be installed before lower capacity DIMMs, in my case the new 4GB DIMMs are in slots 1-2 and the original 1GB DIMMs in slots 5-6. Use the graphic below as a guide for DIMM placement. The image above shows the original position of the memory that came with the Mac Pro and the second set shows the new 8GB of memory installed. Apple sells memory upgrade kits but you have to be insane to buy 8GB of memory from Apple for £1488.00 (price correct as of July 2009), whereas you can get exactly the same thing (Apple don’t make memory remember) for a fraction of the price and install it yourself without any hassle. I purchased 8GB (2 x 4GB) from Crucial for just under £200 and the memory that was delivered has the same original manufactures stickers on as the two 1GB DIMMs installed by Apple in the original specification. The memory installed originally was manufactured by Hynix and so was the memory brought from Crucial.